The new ticket lobby at Target Center a perfect microcosm of the entire $140 million project — and, really, the entire Timberwolves franchise. Video (01:45) : The Minnesota Timberwolves kick off their season Friday and debut $140 million in Target Center renovations that are visible from concourses to courtside and cloud-level seating. 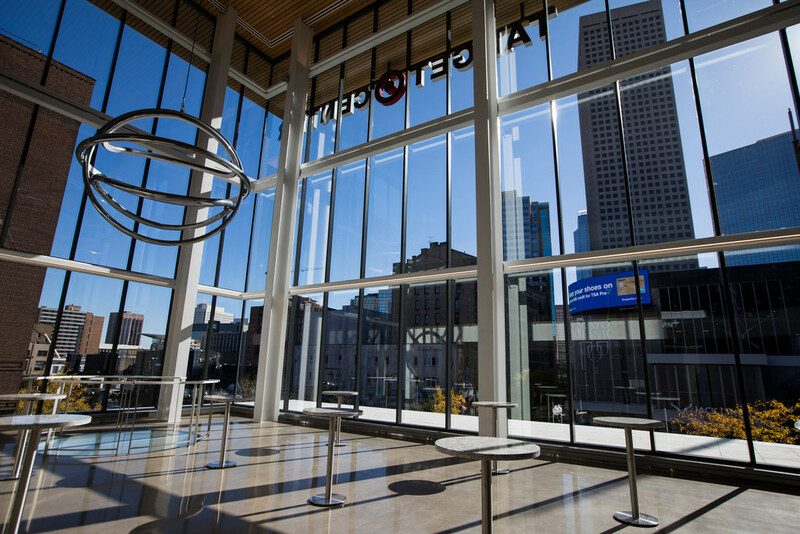 The new ticket lobby at Target Center, home of the Timberwolves and Lynx, is one of the centerpieces of the renovated building. More than that, it’s a perfect microcosm of the entire $140 million project — and really, the entire franchise. The lobby, which the media got to look at Monday as part of a tour of the renovated Target Center, is not really a remodel. It’s a completely different thing than the old, drab, dark space. It’s bright, imaginative and inviting. It’s not even in the same place as the old one, having moved down half a block to the corner of First Avenue and Sixth Street. That’s how much of the remodeled space feels: It’s Target Center, but it’s not Target Center. That’s good. They put the money in the right places. You walk the concourses, which are wider and spruced up. You notice natural gathering spots where there used to be dead ends, wasted space or foreboding walls. You walk in the main arena space and see every one of the 19,000-plus seats has been replaced. The court is new. The courtside seats are more plush, but even the standard seats feel comfortable. All of them are the same color. There is no gum or years of grime on any of them. There’s a beer garden accessible to all fans (the only complaint here being that it feels like the space, on the south end of the arena, is going to get crowded quickly). The Lexus Courtside Club, for the 500 premium seat fans to use, is the sort of high-end space common in all modern sports facilities. And when fans first walk into the remodeled arena Friday for the first Wolves home game against Utah, they will see players wearing revamped uniforms in their new space. It’s as though everything the Timberwolves have done in the last decade-plus, with the exception of drafting Karl-Anthony Towns and trading for Andrew Wiggins, has been shoved into an old storage closet and painted over with dark blue. When a franchise has rebuilt itself too many times to count, while missing the playoffs 13 consecutive seasons in the process, this is not a bad strategy. Of course it helps and is rather fitting that the team about to set foot on the court is the Timberwolves, but they’re not the Timberwolves. That’s the most important remodel of all, and the one that will take precedence over everything else. Because once you get into the building more easily and with more visual flair, work your way through the more spacious concourses, maybe order some upgraded food and drink at a better concession stand and sit down in a more comfortable seat, the experience is pretty much the same. You’re still left to watch 10 guys, most of them tall, occupy a court that’s 94 feet long with two baskets on each end. In all but one of the last 11 seasons, the home fans have seen the Wolves lose more games than they won at Target Center. If Jimmy Butler and co. can reverse that trend and get this team into the playoffs, that will be the real reason to check out the remodeled Target Center more than just once. National views: Was Barr's hit on Rodgers dirty? Are Packers finished?